Fractalkine (FKN) is a unique chemokine that works as a chemoattractant and an adhesion molecule. Previous studies have demonstrated that FKN plays a role in ischaemic and protein-overload renal injury via its cognate receptor chemokine (C-X3-C motif) receptor 1 (CX3CR1). However, involvement of the FKN/CX3CR1 system in diabetic nephropathy remains unclear. We examined the role of FKN/CX3CR1 in diabetic mice and mouse mesangial cells (MMCs). Streptozotocin (50 mg kg−1 day−1) was intraperitoneally administered for 5 days to male Cx3cr1-knockout (KO) mice and wild-type (WT) mice. MMCs transfected with Fkn (also known as Cx3cl1) or Cx3cr1 siRNA, respectively, were used to elucidate the role of FKN/CX3CR1 in extracellular matrix (ECM) synthesis. 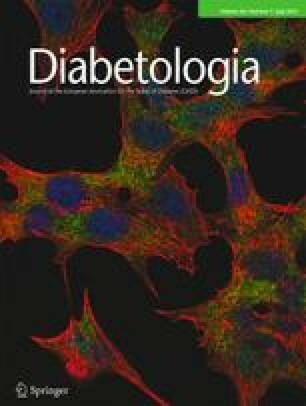 At 12 weeks, diabetic Cx3cr1 KO mice showed no significant changes in plasma glucose, but markers of renal inflammation, fibrosis and ECM, such as the fractional mesangial area, fibronectin and collagen, were significantly lower in diabetic Cx3cr1 KO mice compared with diabetic WT mice. High glucose, oleic acid and TGF-β1 stimulated FKN and CX3CR1 expression, together with the expression of ECM proteins in MMCs, but the effects were significantly attenuated by Fkn or Cx3cr1 siRNA. More importantly, FKN itself increased mesangial ECM through CX3CR1 and subsequent activation of reactive oxygen species and mitogen-activated protein kinases. A neutralising TGF-β antibody inhibited FKN/CX3CR1 in MMCs treated with diabetic stimuli and decreased FKN-induced ECM accumulation. These results demonstrate that FKN/CX3CR1 may play an important role in diabetic renal injury through upregulation of ECM synthesis and could therefore be a therapeutic target for preventing diabetic nephropathy. K. H. Song and J. Park contributed equally to this study. The online version of this article (doi: 10.1007/s00125-013-2907-z) contains peer-reviewed but unedited supplementary material, which is available to authorised users. Diabetic nephropathy is the leading cause of end-stage renal disease worldwide [1, 2]. Current therapeutic options include tight control of blood glucose and blood pressure, and inhibition of angiotensin II. Although these can delay the development and progression of renal injury in diabetes, they do not prevent it. The need for an effective preventive strategy remains. The functional and structural characteristics of diabetic nephropathy include glomerular hyperfiltration, albuminuria and hypertrophy of glomerular and tubular elements. A histological hallmark of diabetic nephropathy is excessive deposition of extracellular matrix (ECM) in the glomerular mesangium leading to glomerulosclerosis, which is closely associated with the progressive decline of renal function in diabetes [3, 4]. However, the exact mechanisms involved in ECM accumulation in diabetic glomeruli have not been explored fully. Monocytes/macrophages are the principle inflammatory cells found in the kidneys [5, 6]. These cells are extravasculated from the bloodstream through a process mediated by chemokines secreted from resident glomerular cells. Chemokines are a large family of proteins that induce monocyte recruitment to regions of inflammation, and several types of chemokine have been identified . Among these, fractalkine (FKN) has strong chemotactic effects, and its expression increases in patients with crescentic glomerulonephritis  and in the glomeruli of mice with various renal diseases including diabetic nephropathy [9, 10]. The unique feature of FKN is that it exists in membrane-tethered and soluble forms. Therefore, it has dual activities, with the soluble form acting as a potent chemoattractant and the membrane-tethered form acting as an adhesion molecule via interactions with its receptor, chemokine (C-X3-C motif) receptor 1 (CX3CR1), on monocytes . On the other hand, studies have demonstrated that cultured mesangial cells (MCs) express CX3CR1 , the only FKN receptor, suggesting that FKN may act directly on renal cells. We reported recently that FKN directly increases MC proliferation through reactive oxygen species (ROS) and mitogen-activated protein kinases (MAPKs) , suggesting that FKN may induce signal transduction in MCs through CX3CR1. However, the exact role of the FKN/CX3CR1 system in diabetic nephropathy, particularly in the glomerular region, is not clearly understood. In the present study, we investigated whether FKN and its CX3CR1 cognate receptor contribute to renal fibrosis and inflammation during the development and progression of diabetic nephropathy. We first examined the effect of Cx3cr1 knockout (KO) on renal fibrosis and inflammation in streptozotocin (STZ)-induced diabetic mice. After we determined the profibrotic and inflammatory effects of FKN in diabetic nephropathy, we further examined the potential role of FKN on ECM synthesis in mouse MCs (MMCs) cultured under diabetic stimuli including high glucose (HG) and oleic acid (OA). All chemicals and tissue culture plates were obtained from Sigma-Aldrich (St Louis, MO, USA) and Nunc (Rochester, NY, USA), respectively, unless otherwise stated. Male Cx3cr1 KO mice, generated on a C57BL/6J genetic background (wild-type [WT] mice), were purchased from Jackson Laboratory (Bar Harbor, ME, USA). Animal experiments were approved by the Ewha Womans University Institutional Animal Care and Use Committee (no. 2010-17-1). Eight-week-old mice were divided into four groups: non-diabetic and diabetic WT mice and non-diabetic and diabetic Cx3cr1 KO mice. Diabetes was induced by intraperitoneal injection of STZ (50 mg kg−1 day−1) for 5 days, as described previously . Non-diabetic mice were injected with an equivalent amount of sodium citrate buffer. Blood was collected 12 weeks after the STZ injection to measure plasma glucose, creatinine, triacylglycerol and total cholesterol, and urine was collected for protein and creatinine assays. Kidneys were removed and frozen in liquid nitrogen until analysis. Plasma glucose was monitored 1 week after inducing diabetes using the glucose oxidase method. The HPLC method was used to measure HbA1c and plasma creatinine was measured by a modified Jaffe method and adjusted for glucose interference (YD Diagnostics, Yongin-Si, Kyunggi-Do, Korea). Urine was collected for 24 h by housing each mouse individually in a metabolism cage with food and water provided ad libitum. Urinary protein was analysed by the Bradford method . Quantitative analysis of glomerular volume and fractional mesangial area (FMA) in glomeruli stained with periodic acid–Schiff’s reagent (PAS) was performed for each mouse as described previously . Paraffin-embedded sections were stained with Masson’s modified trichrome and Picrosirius Red to show the collagen matrix. Each slide was stained using kits for Masson’s trichrome stain (HT15-1KT) and Picrosirius Red, according to the manufacturer’s instructions. Positive staining was quantified with the open-source image analysis program ImageJ v1.34s (Rasband, WS, ImageJ, US National Institutes of Health, Bethesda, MD, USA; http://rsb.info.nih.gov/ij/, 1997–2006). Immunohistochemistry was accomplished using a commercially available kit (Dako, Glostrup, Denmark). The tissue sections were deparaffinised, endogenous peroxidase was quenched using Dako peroxidase solution for 30 min, and then sections were washed and incubated with serum-free blocking solution (Dako). The sections were incubated with anti-F4/80 (1:200, Santa Cruz Biotechnology, Santa Cruz, CA, USA) overnight at 4°C. After washing in PBS, sections were incubated with LSAB2 kit (Dako) and then exposed to 3,3′-diaminobenzidine for 1 min. Images were photographed using a Zeiss microscope equipped Axio Cam HRC digital camera and Axio Cam software (CarlZeiss, Thornwood, NY, USA). MMCs (MES-13) from an SV40 transgenic mouse were purchased from the American Type Culture Collection (Manassas, VA, USA) and maintained in Dulbecco’s modified Eagle’s medium (Invitrogen, Gaithersburg, MD, USA) containing 5% fetal bovine serum (Invitrogen). MMCs were maintained and incubated at 37°C in humidified 5% CO2 in air. Cells were stimulated with recombinant mouse FKN (R&D Systems, Minneapolis, MN, USA). To inhibit ROS, extracellular signal-regulated kinase (ERK), p38 MAPK or TGF-β, respectively, we administered 5 mmol/l N-acetylcysteine (NAC), 50 μmol/l PD98059 (Calbiochem, San Diego, CA, USA), 10 μmol/l p38 MAPK inhibitor (p38i; Calbiochem) or 5 μg/ml anti-TGF-β antibody 1 h before adding FKN, as previously described . Subconfluent MMCs were transfected with 50 nmol/l Fkn (also known as Cx3cl1) or Cx3cr1 small interfering (si)RNA using Lipofectamine RNAiMAX (Invitrogen) for 24 h. The sequences of each siRNA are shown in the electronic supplementary material (ESM) Table 1. Both Fkn and Cx3cr1 siRNA at 50 nmol/l effectively blocked mRNA expression and protein production in MMCs (ESM Fig. 1). Total RNA was extracted from tissues and cells using Trizol (Invitrogen). The mRNA expression was assessed by real-time quantitative RT-PCR using the SYBR Green PCR Master Mix kit (Applied Biosystems, Foster City, CA, USA) with an ABI 7300 Real-Time PCR Thermal Cycler (Applied Biosystems), as described previously (primer sequences are shown in ESM Table 1) . The quantity of the test genes and internal control 18S ribosomal RNA (rRNA) was determined from a standard curve using Applied Biosystems software and was compared with that of controls. Levels of CX3CR1, fibronectin (FN), type I collagen (COL1) and type IV collagen (COL4) protein in homogenised kidneys, harvested cells and media were measured by standard western blot analysis using polyclonal antibodies to CX3CR1 (Abcam, Cambridge, MA, USA), FN (Santa Cruz Biotechnology, Santa Cruz, CA, USA), COL1 (Santa Cruz Biotechnology) and COL4 (Santa Cruz Biotechnology). To measure FN and COL4 protein secreted into the media, we mixed the media (volume normalised by cell protein concentration) with loading buffer (60 mmol/l Tris-HCl, 25% glycerol, 2% SDS, 14.4 mmol/l 2-mercaptoethanol and 0.1% Bromophenol Blue) before separating using SDS-PAGE . Primary-antibody-bound membranes were incubated with peroxidase-conjugated secondary antibody (Santa Cruz Biotechnology). The membrane was developed with a chemiluminescent agent (ECL; Amersham Life Science, Arlington Heights, IL, USA), according to the manufacturer’s instructions. Positive immunoreactive bands were quantified using a densitometer (LAS-3000, Fujifilm, Tokyo, Japan). Tissue levels of ECM proteins were normalised to β-tubulin, and cellular CX3CR1 protein was normalised to β-actin. Cell culture supernatant fractions were collected and centrifuged at 890 g for 5 min to remove cell debris in order to measure soluble FKN and TGF-β1. Soluble FKN and TGF-β1 levels were assayed using a commercial ELISA kit (R&D Systems), as described by the manufacturer, and were normalised to total cell protein. All results are expressed as mean±SE. Mean values obtained from each group were compared by analysis of variance followed by Fisher’s least significant difference method. Non-parametric analyses using the Kruskal–Wallis and Mann–Whitney U tests were also used when appropriate. A p value <0.05 was considered significant. Diabetic WT mice showed significantly reduced weight gain and increased blood glucose, HbA1c, kidney weight, triacylglycerols and urine excretion in response to STZ. However, none of these factors was significantly changed in Cx3cr1 KO mice (ESM Table 2). Glycogen deposition in glomeruli was measured by PAS staining and scored to indicate glomerulosclerosis severity. PAS staining showed that glomerular volume and FMA were significantly increased in diabetic WT mice compared with control WT mice, whereas those of diabetic Cx3cr1 KO mice were decreased compared with diabetic WT mice (Fig. 1). These results clearly demonstrate the ability of FKN/CX3CR1 to attenuate STZ-induced pathological alterations in renal structure during progressive kidney disease. Masson’s trichrome and Picrosirius Red staining in renal tissues was performed to reveal the regional changes in collagen accumulation in diabetic kidneys. Collagen was strongly deposited in both the glomeruli and tubulointerstitial area of diabetic WT mice compared with control WT mice. Cx3cr1 KO effectively prevented collagen deposition in both glomeruli and the tubulointerstitial area (Fig. 2). Notably, CX3CR1 deficiency markedly attenuated kidney fibrosis induced by diabetes. Next, we measured some markers of glomerulosclerosis and fibrosis to determine the impact of Cx3cr1 KO on diabetic kidneys. The mRNA expression of Tgf-β1 (also known as Tgfb1; Fig. 3a), Fn (also known as Fn1; Fig. 3b), Col1α1 (also known as Col1a1; Fig. 3c), and Col1α2 (also known as Col1a2; Fig. 3d) was increased in diabetic WT kidneys compared with control WT mice. Levels of these markers were significantly lower in diabetic Cx3cr1 KO mice compared with diabetic WT mice. Renal levels of TGF-β1 (Fig. 3e), FN (Fig. 3f,g), and COL1 (Fig. 3f,h) also showed results similar to those obtained for mRNA expression. Staining for F4/80, a marker of macrophage infiltration, was performed in renal tissues to examine the glomerular macrophage infiltration in diabetic kidneys. F4/80-positive macrophages were significantly infiltrated in diabetic WT mice compared with control WT mice. Cx3cr1 KO effectively ameliorated macrophage infiltration in both glomeruli and the tubulointerstitial area (Fig. 4a–e). Similarly, mRNA expression of F4/80 (also known as Emr1; Fig. 4f) and monocyte chemoattractant protein-1 (Mcp-1, also known as Ccl2) (Fig. 4g) also indicated enhanced renal inflammation in diabetic WT kidneys. Levels of these inflammation markers were significantly lower in diabetic Cx3cr1 KO mice compared with diabetic WT mice. To reveal the exact role of FKN/CX3CR1 under diabetic stimuli, we first measured FKN/CX3CR1 levels in MMCs cultured under diabetic conditions. As shown in ESM Fig. 2, Fkn/Cx3cr1 mRNA levels were induced significantly by HG, OA and TGF-β1. Furthermore, treatment of MMCs with HG, OA and TGF-β1, but not mannitol, significantly increased FKN protein levels in both MMC cell lysates (ESM Fig. 3a) and culture supernatant fractions (ESM Fig. 3b) and CX3CR1 protein levels in cell lysates (ESM Fig. 3c–e). To clarify whether the FKN/CX3CR1 system is directly involved in the changes in ECM proteins that occur in the diabetic condition, we examined the direct effects of FKN on TGF-β1, FN and COL4 synthesis in MMCs. Recombinant FKN protein at >25 ng/ml directly increased mRNA expression of Tgf-β1 (Fig. 5a), Fn (Fig. 5b) and Col4α1 (also known as Col4a1; Fig. 5c). FKN also induced protein levels of these molecules in MMCs (ESM Fig. 4). In contrast, these increases were significantly ameliorated by inhibiting CX3CR1 with 50 nmol/l Cx3cr1 siRNA (Fig. 5d–f), suggesting that FKN directly induced ECM accumulation in MMCs via CX3CR1. Next, we evaluated the role of the FKN/CX3CR1 system in the synthesis of ECM proteins induced by diabetes in MMCs using Fkn or Cx3cr1 siRNA, respectively. Diabetic-stimuli-induced Tgf-β1, Fn and Col4α1 mRNA expression (Fig. 6) and protein levels (ESM Fig. 5) were effectively abrogated by Fkn or Cx3cr1 siRNA. As TGF-β1 is the final mediator of renal fibrosis, the role of TGF-β1 in diabetic-stimuli-induced FKN/CX3CR1 and FKN-induced ECM protein synthesis in MMCs was analysed using a TGF-β-neutralising antibody. The TGF-β-neutralising antibody significantly inhibited HG- and OA-induced Fkn/Cx3cr1 mRNA expression (Fig. 7a,b) and protein levels (ESM Fig. 6a,b) in MMCs. In addition, the TGF-β antibody effectively abrogated FKN-induced Fn and Col4α1 mRNA expression (Fig. 7c,d) and protein levels (ESM Fig. 6c,d) in MMCs. FKN at 50 ng/ml significantly increased mRNA expression of Tgf-β1, Fn and Col4α1 in MMCs. Pretreatment with NAC, PD98059 or p38i effectively inhibited the FKN-induced expression of each mRNA (Fig. 8). As shown in Fig. 9, we demonstrated that: (1) increased fibrosis in diabetic kidneys was significantly ameliorated in Cx3cr1 KO mice; (2) enhanced macrophage infiltration in diabetic kidneys was effectively blocked in Cx3cr1 KO mice; (3) FKN/CX3CR1 levels in MMCs increased significantly following exposure to diabetic stimuli, including HG, OA and TGF-β1; (4) FKN itself directly enhanced ECM synthesis; (5) inhibiting FKN or CX3CR1 using siRNA effectively blocked diabetic-stimuli-induced ECM synthesis in MMCs; (6) FKN interacted with TGF-β1 in MMCs cultured under diabetic conditions; and (7) FKN-induced mesangial ECM upregulation was mediated by ROS and MAPK. The role of the FKN/CX3CR1 system in diabetic kidney disease was initially examined using Cx3cr1 KO mice at 12 weeks after inducing diabetes. Diabetic nephropathy variables, such as proteinuria, glomerular hypertrophy, macrophage infiltration and renal ECM accumulation, were significantly upregulated in STZ-injected diabetic mice. All the diabetic nephropathy variables except proteinuria were effectively blocked in diabetic Cx3cr1 KO mice in the presence of equivalent hyperglycaemia. These results suggest that the FKN/CX3CR1 system may play an important role in the development and progression of fibrosis and inflammation in diabetic kidneys. It is important to note that Cx3cr1 KO did not attenuate the degree of proteinuria in the mice with STZ-induced diabetes despite its beneficial effects on glomerular matrix expansion under our experimental conditions. Protein permeability increases across the glomerular filtration barrier in diabetic nephropathy, probably because of haemodynamic stress [18, 19], increased membrane pore size, reduced anionic charge [20, 21] and upregulated permeability factors such as vascular endothelial growth factor [22, 23]. Anti-TGF-β1 neutralising antibody also effectively blocks ECM accumulation in diabetic db/db mice without ameliorating proteinuria . As mesangial ECM accumulation is responsible for glomerulosclerosis in diabetic nephropathy, we evaluated the role of FKN/CX3CR1 in ECM accumulation using MMCs. As expected, the levels of FKN/CX3CR1 in MMCs increased significantly following HG exposure, consistent with previous studies showing HG-induced FKN and CX3CR1 upregulation in isolated glomeruli  and vascular smooth muscle cells . In addition, OA and TGF-β1 also upregulated FKN/CX3CR1 in MMCs. TGF-β1 induces FKN upregulation in mouse tubular epithelial cells  but not in rat MCs , suggesting a context-dependent effect of TGF-β1 on FKN. Considering FKN exists in soluble and membrane-tethering forms, it may function not only as a chemokine but also as an adhesion molecule, leading to facilitated autocrine cellular activation and inflammatory-cell migration. Actually, FKN by itself stimulated the expression of TGF-β1 and the ECM proteins FN, COL1 and COL4 in MMCs. The result that Cx3cr1 siRNA effectively inhibited FKN-induced ECM synthesis in MMCs clearly showed that local FKN signalling plays an important role in mesangial ECM upregulation. Furthermore, inhibiting FKN or CX3CR1 by specific siRNA effectively suppressed HG-, OA- and TGF-β1-induced ECM synthesis. These data, together with the observed increases in FKN/CX3CR1, suggest that FKN/CX3CR1 may play an important role in diabetes-associated ECM synthesis in MMCs. In vivo data showing decreased ECM accumulation in diabetic Cx3cr1 KO mice are consistent with these results. A direct role for FKN in mesangial ECM synthesis is in accordance with a study that demonstrated the direct role of MCP-1, another chemokine, on ECM synthesis in MMCs. MCP-1 increases following HG treatment and recombinant MCP-1 treatment directly increases ECM synthesis in MMCs . TGF-β1 is a key pro-fibrotic cytokine that mediates ECM accumulation in diabetic nephropathy. In the present study, inhibiting FKN or CX3CR1 with their respective siRNA inhibited diabetic-stimuli-induced TGF-β1 upregulation, whereas an anti-TGF-β antibody effectively suppressed diabetic-stimuli-induced FKN/CX3CR1 expression and FKN-induced ECM synthesis in MMCs. These findings suggest that FKN/CX3CR1 may interact with TGF-β1 in an autocrine or paracrine mechanism, or both, in MMCs under diabetic conditions. In line with the present data, it has been shown that FKN and CX3CR1 regulate TGF-β1 and tissue fibrosis during wound healing , while TGF-β1 increases FKN production in human airway smooth muscle cells . However, the exact mechanisms of how FKN/CX3CR1 and TGF-β1 regulate each other remain to be elucidated. Finally, we wanted to reveal the post-receptor signalling of FKN in MMCs. FKN itself activates vascular smooth muscle cell proliferation through phosphatidylinositol-3 kinase, Akt and nuclear factor of kappa light polypeptide gene enhancer in B cells 1 (NF-κB)  and induces janus kinase and Stat pathways in a rat model of severe acute pancreatitis . In MMCs, ROS and MAPK have been shown as the signalling molecules induced by FKN . In line with these studies, we demonstrated that inhibitors of ROS or MAPK effectively inhibited FKN-induced mesangial ECM synthesis. Detailed cellular signalling of FKN is still an important issue for future study. In conclusion, we demonstrated that FKN/CX3CR1 may play an important role in diabetic renal injury by upregulating ECM synthesis and suggest that the FKN/CX3CR1 system could become an effective therapeutic target for preventing diabetic nephropathy. This study was supported by 2012R1A2A1A03006092 and R31-2008-000-10010-0 (WCU) from an NRF grant funded by the Korean Government (MEST), a Ewha Global Top5 Grant 2012 of Ewha Womans University to H. Ha and grants from the National Institutes of Health (NIDDK) to R. Natarajan. KHS acquired, analysed and interpreted the data, and drafted the article. JP contributed substantially to the conception and design of the study, the acquisition, analysis and interpretation of data and to drafting the article. JHP acquired, analysed and interpreted the data, and drafted the article. RN made substantial contributions to the conception and design of the study, and revised this article critically for important intellectual content. HH made substantial contributions to the conception and design of the study and to the analysis and interpretation of data, revised this article critically for important intellectual content. All authors gave final approval of the version to be published.